All Exposures double weight 4x6 pocket pages with ID labels are made of photo safe material which makes them the safest photo pocket pages available to protect your most precious photos. I'm using these pocket pages in the photo albums I'm creating for my family; their heavyweight construction will withstand years of use. I use these for family archival photos. They have consistently been good quality and reliable. I have been using them for several years. PLEASE bring back the old 5X7 sleeves without the ID labels! At least give customers the option of the ID labels. I don't need them. I have been using these pages for years and now the pages in my albums are not uniform. These stick out from the rest of the pages. Will not be ordering any more. Will have to spend time looking for the old style from someplace else. After 12 years of shopping at Exposures both for albums and storage pages I had to buy double weight 4x6 pages with ID labels because I was told by customer support that the same product in single weight has been discontinued. I hoped that these will be similar to the ones we used but sturdier. What a huge disappointment!!! Page looks nothing like a single weight one (much larger in size) and cheaper looking! Because of its size it sticks out horribly and I am looking for alternative retailer now. What a shame!!! Have used them for 20 years. You offer special deals for new customers if they sign up. Why don't your long time customers get special deals on products they order often? I purchased the Double Weight Photo Pocket Pages with ID Labels, 4x6 Opening for the option of labeling a special occasion. I take a lot of photos for all occasions. These photo pocket pages will allow me to describe specific occasions. Ordered them twice before. I like them for my photos. I've used these pages for years. Most of my photos are horizontal , and these pages provide plenty of space for identification labels which are included. The photos are protected and easy to view. I've been buying these for years.... I have never had an issue with them. They hold up indefinitely. Makes a perfect spot to have a pocket for each day of the month to put recipt in. Acid-free pages for vacation photos. I need to put photos, not on my scrapbook pages, in a section of my album. I like to use my best photos on pages, but want to see similar photos or other photos in the album, too. Good quality and perfect for the albums I use. Really great quality. Heavy duty for years viewing. wish Exposures would return to single weight pages!! Use these in our Christmas Through The Years albums to save photo Christmas cards from friends & family. I chose this for the labels. We have a newborn and want to notate every event. GOOD QUALITY AND HAVE USED BEFORE. I ran out and have kept an album for halloween and christmas for each year since 2005. I’ve ordered these for many years and they have held up very well with repeated handling. Have used them before and was pleased with product. Same reason as given in 2016. However, it has taken me a year to figure out an alternative to the album that you used to sell for this particular page format. Infuriating that you no longer sell it. I used these before and am very happy with them. Just enough per page for some projects. The heavyweight photo pages hold up well with repeated use. My Grandaughter gave me an album from you and she recommended this item. For first day covers as well as for scrapbooking. which photo albums will these pages go with? BEST ANSWER: Thank you for your question. 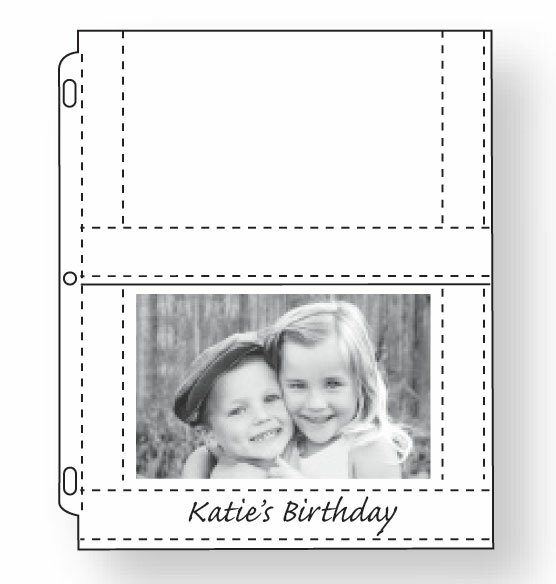 The Double Weight 4x6 Photo Pocket Pages With ID Labels will fit three ring albums. We hope this information will be of help to you. Are the double weight 4 by 6 photo pocket pages with labels (double weight) a different size than the same pages in single weight? BEST ANSWER: Thank you for your question. The size of the pages are the same. The double weight are twice the thickness for more durability and protection. We hope this information will be of help to you. I prefer the single weight pages. Will Exposures be offering them again? what size is the page???? BEST ANSWER: Thank you for your question. 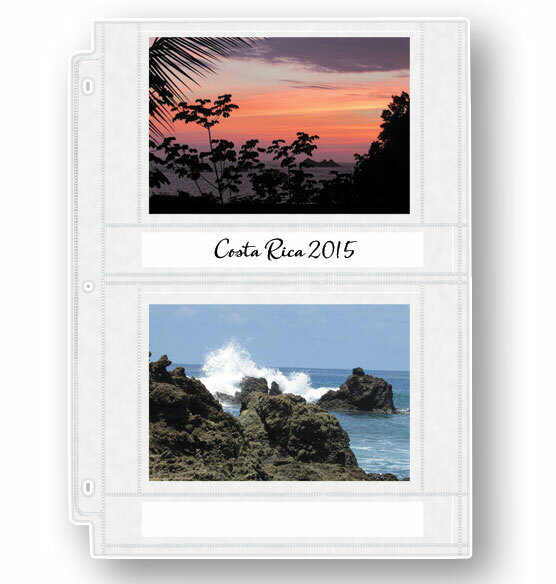 The Double Weight 4x6 Photo Pocket Pages With ID Labels is 10" x 11 1/2". We hope this information is of help to you. 319989 do you stock these pages in black? BEST ANSWER: Thank you for your question. The Pocket pages only come in clear and the ID labels only come in white. We hope this is of help to you.